Saba Infraestructuras (Saba) today held its Extraordinary General Shareholders Meeting following the changes in the company’s shareholding structure, announced on 30 July, which resulted in CriteriaCaixa obtaining a 98.8% stake in Saba. The President and Chief Executive Officer of Saba, Salvador Alemany and Josep Martínez Vila, respectively, spoke of CriteriaCaixa’s acquisition from Torreia, KKR and ProA of 48.7% of Saba, an operation that involved an outlay of €438 million, which represents a value per share of €1.217, putting the total value of Saba at 900 million euros. The President of Saba, Salvador Alemany, recalled that in 2011 shareholders contributed €400 million by choosing the extraordinary dividend option distributed by Abertis for the creation of Saba. Salvador Alemany stressed that "there is no doubt that, seven years on, Saba has far exceeded the expectations at all levels that we set as shareholders". 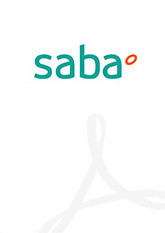 He also added that in this same period, Saba has distributed €80 million from the share premium account. In summary, "the investment of 0.54 euros per share in 2011 could lead now in 2018 to 1.325 euros per share in total for all those shareholders who accept the offer of CriteriaCaixa", added the President of Saba. As regards Saba's main management figures between January and July 2018, ordinary operating income stood at €128 million (+4%), while ordinary EBITDA increased to €60 million (+6%). The CEO of Saba, Josep Martínez Vila, also explained that, since last June, the company has completed several expansion operations in Chile and Portugal. It has been awarded the concession for 35 years of the General Mackenna car park, with 390 parking spaces, in Santiago de Chile, and has agreed a 7-year extension of the management contract of Clínica las Condes, with 2,700 spaces, also in Santiago de Chile. In Portugal, the company has begun its 10-year concession of the Exponor car park, with 2,000 parking spaces, located in Matosinhos, near Porto, and has signed a new car park lease contract for 35 years for the Campus Nova School Parking of Business & Economics, with 520 parking spaces, located in the municipality of Cascais, 20 kilometres from Lisbon. Josep Martínez Vila highlighted that the company, after the distribution of the share premium, now has cash and cash equivalents of €80 million, credit facilities of €50 million and a ratio of net debt/EBITDA of 4.5x which will allow it to continue with its development strategy and to successfully undertake new acquisitions.